Choosing a color for one of the rooms in your home can be a daunting task, but with some expert guidance, it doesn’t have to be. Each color inspires a different sense in people. Certain colors have become go-tos for specific rooms, while others are faux-paus for various places in a residence. Let’s go through some rooms and discuss what our Triangle-area customers should keep in mind for each. We will start with the bedroom since it’s such an important place of retreat from one’s day-to-day life. Being a place of relaxation, it’s important to choose a color that puts one at ease. Reds and yellows are great colors for certain areas of the home, but they might add too much stimulation in a bedroom and could prevent rest. Instead, consider softer colors like light greens and blues or more neutral colors like beige, tan, gray, or even black. Think of colors that will relax you, and won’t shock potential buyers when you go to sell your home later. In bathrooms, it’s common to stay within a neutral color family, but there are some unique ‘neutral’ colors in this day and age besides basic beige. Taupe, seafoam green, sky blue, and ash gray are all modern styles that are not excessively colorful. Each of these and many others can be easily paired with whites, black, grays and other common colors for sinks, toilets, counters, tubs, and tiles. Before making a decision, take into account what the other colors used in your bathroom are at the moment. If you choose a color you enjoy that doesn’t match anything else, you may be tempted to replace a lot of other elements in the bathroom too. Bathroom remodeling can get expensive quickly, so planning is key. While it’s best to avoid bright colors in bedrooms and bathrooms, the more public rooms of the house are another story. The extra stimulation and energy inspired by reds, yellows and other bright colors can be a positive thing when you have company over or are spending time with family. But you do not have to feel any obligation to have ‘louder’ colors in these areas. You can feel free to be more creative in public spaces, but it is also perfectly appropriate to maintain the neutral look of grays and tans. It’s really a matter of personal style and preference. 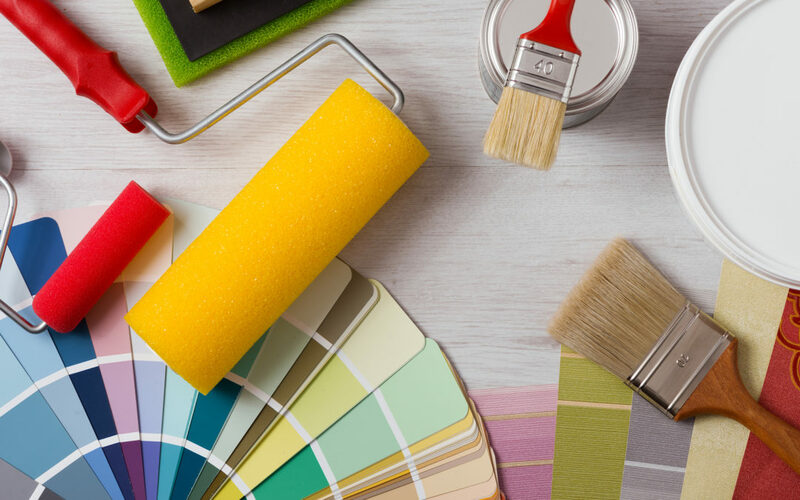 Whatever paint you decide on, Robert Gordon Services can professionally, affordably and quickly repaint your walls with the color of your choosing. If you live around Raleigh, Morrisville, Durham, Cary or elsewhere in the Triangle and are thinking about repainting, call 919-250-8038. We will walk you through the repainting process and give a free estimate for your project.